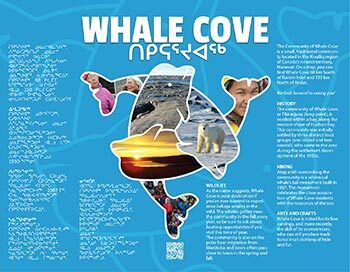 Visitors to Whale Cove can tour the community on their own, on foot. Starting at the Government Offices, head down to the beach area where hunters will return with the day’s catch. Following the beach road south, with Hudson Bay on your left, the visitor will come to the fuel storage tanks, where in summer a year’s supply of fuel is stored for the long winter. Retrace your steps and head up the hill to the new housing development. From the farthest point here, there is a trail that leads out on the land with a few lookouts over Wilson Bay to the south. Returning to the beach, visit the nearby fish plant, which processes the day’s commercial catch of Arctic Char. North of the town, more all-terrain vehicle trails lead to small lakes. A number of these are favorite picnic areas, and in summer berries can be plentiful. Fish in the deepest of these for lake trout and whitefish. Keep a sharp eye out for siksiks or ground squirrels, and other small mammals of the tundra. In July, the people of Whale Cove gather to celebrate Hamlet Days with races, tea and bannock making contests and traditional Arctic Games. There is usually a feast and some traditional Inuit drum dancing and singing as well.